A master of the short form of prose and best remembered for his humorous and satirical works. "Om ons één eie taal tot nut te gebruik is groter kuns as om sewe vreemdes by te leer." Cornelis Jacob Langenhoven was born on 13 August 1873 on the farm Hoeko near Ladismith, Cape Province. His mother died five days later and Cornelis was raised by his aunt and uncle. He received his first education from several governesses and the excellent Dutch Meester Bloemkolk. After schools in Ladismith and Riversdale he studied at the Victoria College in Stellenbosch (BA 1895). At that time Stellenbosch did not have a Law Faculty. Langenhoven became apprentice to a solicitor in Ladismith and, in 1899, obtained - after private studies - a LL.B. at the University of Good Hope in Cape Town. He then worked as an attorney in Cape Town and in Oudtshoorn. Langenhoven made a stand for the acceptance of Afrikaans in general and as the first language in schools instead of Dutch. 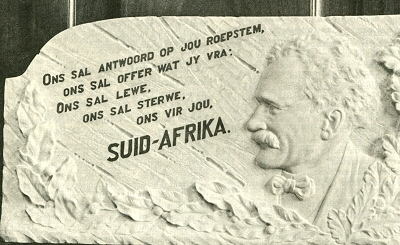 In 1910 he wrote the article, The problem of the dual language in South Africa. 1912: Editor of the Oudtshoorn newspaper Het Zuid-Westen. In 1914 he became Member of Oudtshoorn's Provincial Board of Directors and later Senator of the Cape. 26 July 1915 saw the first edition of Die Burger and under the pseudonym Sagmoedige Neelsie Langenhoven contributed a regular column. Langenhoven was instrumental in the movement for the acceptance of Afrikaans as a language, in general and as the first language in schools, instead of Dutch. This culminated in the language officially being used in parliament in 1925, and by 1927 was recognised as an official language of South Africa, together with English. Langenhoven remained in close contact with his Alma mater in Stellenbosch and returned often to give one of his fiery speeches. In 1897 he was married to Magdalena Maria (Vroutjie) Hugo, a widow with three children. Their only daughter, Engela was born in 1901. Kerneels Langenhoven died on 15 July 1932 at Oudtshoorn. After his wife's death, their home, Arbeidsgenot ("the pleasure of work"), was turned into a museum in 1955. They lived there from 1901 until 1950. In 1973, on the occasion of the centennary of his birthday, a sculpture of Langenhoven by Olgo Pieri was installed in his memory at the University of Stellenbosch and a sun dial built after his design (from 1926). Langenhoven was 'n aartsrebel, 'nonkonformis, maar tewens iemand met 'n sterk prinsipiële gerigtheid. 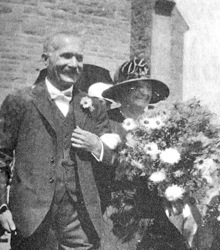 Langenhoven wrote South Africa's anthem Die Stem van Suid-Afrika (1918), the first detective novel in Afrikaans, Donker Spore (1926), the first translation into Afrikaans of Omar Khayyam's Rubáiyát, and retold stories from the Bible. His autobiography: U dienswillige dienaar, was published in 1932. A collection of his essays that appeared in Die Burger was published posthumously in 1941: Aan stille waters. Langenhoven's Versamelde werke, were published first in 14 volumes (Cape Town, 1933 -1937 and later in 16 volumes (from 1949). These words were set to music by the Reverend Marthinus Lourens de Villiers in 1921.
: Ons sal lewe, ons sal sterwe ons vir jou, Suid-Afrika. Waar en trou, as Afrikaners kinders van Suid-Afrika. Om te lewe, om te sterwe ja ons kom, Suid-Afrika. Sus daar 'n wieglied uit bekkie van voëltjie. So noem die voëltjie haar kuikentjies kindertjies. Sus immer, suis immer, ruis immer, rus nimmer. "Mêê" sê die bokkies en "Boe" sê die koeietjies. Weg van die moedertjies, eensaam en jammertjies. Moedertjies huil oor die kalfies en lammertjies. Wakend oor mensies en diertjies en boompietjies. Saggies gesus in die seewieg gemeensaampies. Bo gaan ons uitspan en slaap tot na morentoe! Dan na die lêplek, geduldige ossietjies! Pappa vra: "Praat hul van Pappa vanaendjie? Pad is so lank en so verre vandaantjie!" Kook hy sy keteltjie daar by die vlammetjie. Pappa eet droë brood, Mamma kry bolletjies. Pappa kom huis toe, sy waentjie is volletjies. Pappa kom huis toe na kindjie en Mammetjie. Saggies en veiligies, liefies en warrempies. Wiegies maar, sussies maar, kindjielief tapies maar! Hofmeyer Hall, 39, Church Street. At Langenhoven's time known as the CVJ Hall (Cristelijke Jongelieden Vereniging - Young Christians' Association). 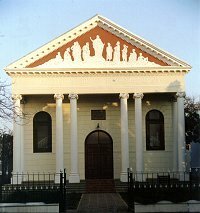 The Church Council of the Moeder Kerk renamed the classicist hall , with its Ionic columns and Greek pediment, after the man, whose Bible classes led to the erection of the building (in 1900): N J Hofmeyer, one of the first two professors of the Stellenbosch seminary. Ex students, of some 50 or 60 years ago, remember the CVJ Hall primarily as a venue for well-attended meetings of the debating societies and student mass meetings. There was, for instance, the night in March 1930 when C J Langenhoven addressed the Union Debating Society. Having been introduced by the chairman, Langenhoven took a step forward, stared intently over the heads towards the back of the hall, pointed dramatically at the door behind us, and called out in a loud voice: "My friend, what lies around the corner?" We, foolish young students, spun around in concert to see who the friend might be. But with this trick, Langenhoven had caught our attention, and once the laughter had subsided, proceeded to deliver a brilliant talk on all that might await us "around the corner."